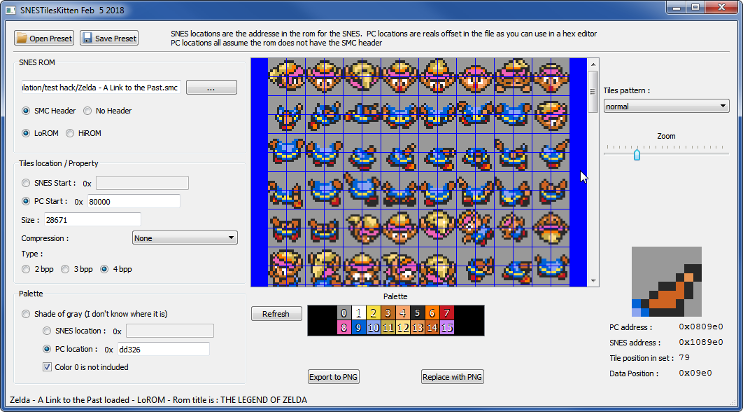 SNESTilesKitten is a tool to view/extract/inject graphic tiles in a SNES Rom file. It allows you to use SNES address (support HiROM/LoROM) so you can use it to discover tile location directly from ASM trace. You can create tiles preset with it so you can reuse your discoveries or share them with other user of SNESTilesKitten. Some presets are provided with it. You can download the latest release here It’s a Windows 64 bits version. SNESTilesKitten offer a command line tool : SNESTinyKitten. Just run the executable with the –help command to learn more. Here an example of injecting a set of tiles. D:\Project\SNESTilesKitten>SNESTinyKitten.exe --inject --copy --rom "D:\Project\Zelda - A Link to the Past.smc" --input "D:\Project\The Legend of Zelda - Link Sprites derppy.png" "D:\Project\SNESTilesKitten\Presets\The Legend of Zelda - Link Sprites.stk"
SNESTilesKitten is maintained by Skarsnik. This page was generated by GitHub Pages.